As a pediatric sports medicine specialist, I typically spend my days ministering to the maladies of the active child or adolescent; but as a public health advocate, I worry more about the other end of the spectrum: the growing (pun intended), global pandemic of childhood underactivity and obesity. The global problem of underactivity in youth is being investigated by many people. 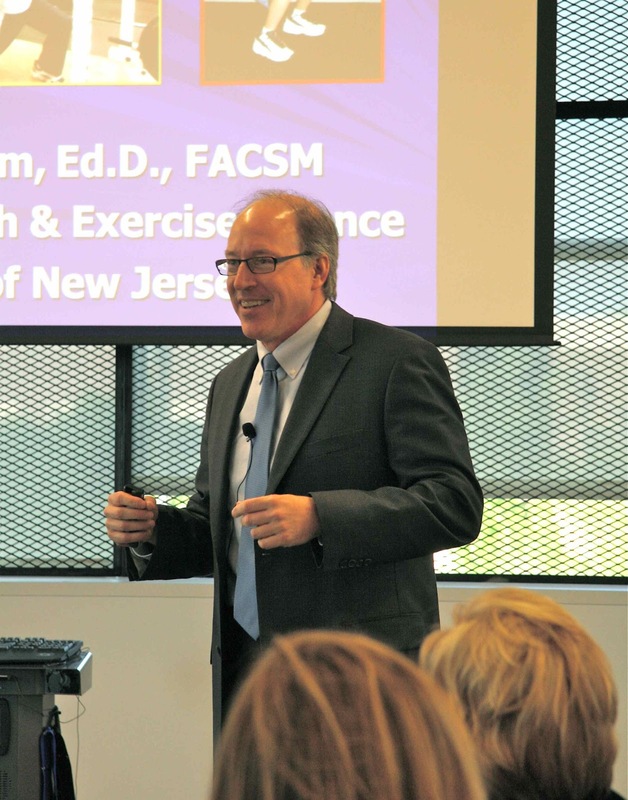 One of the leaders in this field is a Jersey boy; no, not Jon Bon Jovi…… I have been a big fan of Dr. Avery Faigenbaum, from the College of New Jersey, for some time. From his work investigating the safety of resistance training in children to his new focus on “Exercise Deficit Disorder” (EDD), his work has been an inspiration to me. Last summer, I had the pleasure of working with him here in Columbus, Ohio, and we even got to record a session of Nationwide Children’s Hospital’s “Pediacast” where we discussed the problem of EDD. This summer, I got to catch up with Dr. Faigenbaum at the American College of Sports Medicine meeting in Indianapolis. Though he could probably bench press three of me, I successfully arm-wrestled him into doing a guest blog. Just in time: Dr. Faigenbaum is heading to Argentina in July as a guest professor. The pervasive reach of physical inactivity has now spread worldwide and some authors have appropriately described this issue as a “pandemic” (4). Levels of physical activity among modern-day youth are down while time spent watching television and surfing the Internet are up. Researchers from Canada recently assigned a letter grade of D- to physical activity levels in 5- to 17-year olds (1) and findings from the Youth Risk Behavior Surveillance survey indicate that one-third of high school students in the United States played video or computer games for 3 or more hours on an average school day (5). The decline and disinterest in physical activity appears to emerge early in life, and by the time students enter high school their sedentary habits are difficult to break. As a professor of pediatric exercise science, I am deeply concerned that regular physical activity has become a neglected dimension of health that has yet to garner the medical power and political clout of other pediatric and adolescent health issues such as cigarette smoking or super-sized beverages. While the benefits of daily physical activity during the growing years are undeniable, its proven role in reducing the risk of non-communicable disease is undervalued. Parents, policy makers and healthcare providers are missing a message that is vital to the health and well-being of youth. Daily exposure to physical activity early in life as part of transportation, play, recreation, sport, and physical education will reduce the development of future life-altering diseases. We need to identify the exercise deficient child early in life when the child’s body and brain are most responsive to learned behaviors. This practice will ensure that this clinically silent disorder is detected and treated before youth become resistant to our interventions. 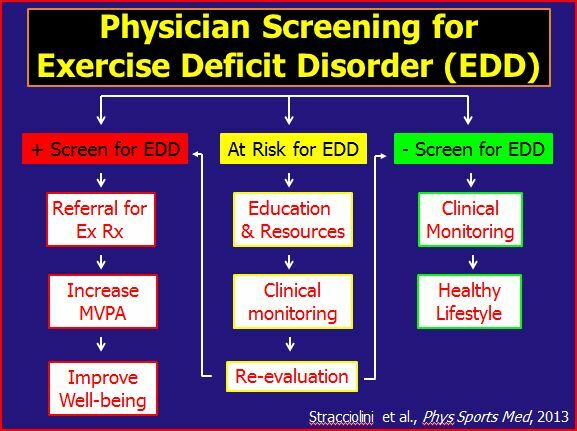 My colleagues and I have recently coined the term “Exercise Deficit Disorder” or EDD to describe a condition characterized by reduced levels of daily moderate to vigorous physical activity (MVPA) (2, 3). That is to say, children and adolescents who are not accumulating at least 60 minutes of MVPA daily should be identified and treated with the same energy and resolve as would be applied to a young patient with hypertension or dyslipidemia. Exercise deficit disorder is a unique medical condition in that there are no clinical markers or laboratory tests to secure the diagnosis and there are no medications to treat physical inactivity. If we wait until youth become overweight we will perpetuate symptom-reactive treatment strategies that may be ineffective and costly in the long-term. We need to focus our efforts on the development of preventative strategies that provide a more effective and sustainable public health approach for identifying and treating youth with this modifiable risk factor. A key tenet of this approach is that physical activity needs to be “prescribed” by physical education teachers, pediatric exercise specialists, and health care providers. The term exercise deficit disorder can be used to raise public awareness about the importance of daily exercise. Healthcare providers can then facilitate the development of a management plan that should include family education about healthy lifestyle choices. Simply stated, telling an inactive child to get more exercise is akin to asking an obese teenager to eat less food. Developmentally appropriate interventions that target deficits in muscle strength and motor coordination in a fun and socially supportive environment are needed. Such interventions have been found to enhance children’s physical competence and perceived confidence in their physical abilities. Juvenal: “Mens sana in corpore sano” (A Healthy Mind in a Healthy Body) Exercise Deficit Disorder circa 100 A.D.! The belief that exercise is good for health and well-being predates the historical writings of ancient Greek and Roman philosophy. Nonetheless, most health care providers lack formal training in the prescription of exercise. Some physicians and parents seem to underestimate the therapeutic potential of daily physical activity. Our societal response to the current pandemic of physical inactivity has been incomplete, second-rate and largely unsuccessful. It is time we collectively embrace the contention that the early recognition of physical inactivity, like smoking, be viewed as socially unacceptable and unattractive. We need to critically examine our current policies, practices and beliefs. For example, how would you react if your local school board voted to allow children to smoke during recess? On the other hand, how would you react if your local school board voted to eliminate daily physical education? Excercise Deficit Disorder. EDD. You’ll be hearing a lot more about it in the coming years. What do you think about it? Let us know. Comments on this blog are always appreciated! And take our poll on sports medicine apps at the CJSM home page. A great blog highlighting a serious issue in modern society. The importance of exercise in children’s lives should not be underestimated, nor should the absence of exercise. Research from Australia, New Zealand and the UK have all shown that fundamental movement skills of children aged 10 and under are very poor, meaning that we are failing to teach children the skills necessary to be able to engage in life-long exercise. A recent review of physical education in the UK (by Ofsted) highlighted that there was not enough “physical in physical education” and limited provision for obese pupils. This means we are at risk of not only failing to provide children with the skills to exercise, but also failing to provide them with an adequate physical stimulus during P.E. lessons to encourage important physiological adaptations. The situation is never helped where myths regarding the exercising child continue to be perpetuated by ill-informed individuals of the medical community. A recent column in a national UK newspaper (Daily Mail) written by a general practitioner (GP) advised that children should not engage in resistance training as this would be dangerous to the growing child. Such a statement is nonsense and more than likely would have been made by a professional who received extremely limited training on the benefits of exercise to prevent and treat medical conditions, and I doubt whether any of this training would have considered paediatric populations. Hopefully, we can begin to reverse the current global situation and reverse the increasing trend of exercise deficit disorder, but it will take a collective effort. stimulated your commentary!!! Thanks again for sharing. I couldn’t agree more with dr faigenbaum’s point. I am currently an elementary physical education teacher and had the privilege with work with dr faigenbaum on a project called “FIT” which is fundamental integrative training and helps the kids work on health and skill related fitness components in a fun way. Kids need to exercise and our job is to make it enjoyable so they want to be active throughout their life. They need to start young and see the benefits and hopefully they will make the appropriate choices growing up regarding exercise. the concept of Exercise Deficit Disorder gets widely promulgated. Dr. Faigenbaum offers an innovative approach to tackling an obvious but widely ignored public health problem. Though he acknowledges multiple causes for the alarming increase in child obesity, he persuasively argues with compelling evidence that insufficient physical activity is a primary contributing factor. Exercise Deficit Disorder should be embraced by the medical community and the general public as a practical diagnosis and effective treatment modality. Just as cigarette smoking was long considered a normative behavior before the toxic health risks were known and publicized, I’m hopeful the EDD movement will transform how we address child obesity. Thanks for those insightful comments. I am working on developing strength/power in 15-16 y/o baseball players of high quality this summer It is of interest that since I have the privilege of having been in the business for over 40 years, I noticed a drastic drop off in body awareness and technical skill abilities. I have had to make a special effort to focus on precision in execution, body awareness and movement patterns. This is a direct reflection of the loss of Physical Education programs in California schools. Even though these kids throw in the high 70’s to mid-80’s it is interesting to see that movement mechanics are actually stunted. No education, no execution. It is a risk factor in injury and can only be corrected by attention to the younger students. We likewise see that same deficit in fundamental motor skills. Leads to so many of the injuries we see in our clinics. Thank you for sharing. A very interesting idea and a good way to focus attention on the importance of physical activity for young people. I have some questions as to how children would be diagnosed with EDD and what doctors would prescribe for them. Young people’s activity levels are strongly influenced by their parents and the schools they attend. Would this absolve parents and schools of their responsibilities? I believe that many children and adolescents not meeting PA guidelines can be enticed into activity in the right setting. I would like hear more about EDD and it will be fascinating to see how the media reacts to this idea. As Dr. Faigenbaum points out, “The decline and disinterest in physical activity appears to emerge early in life…”. This leads many of us to ponder the question why? Physical Education is like any academic subject, some people like and some do not. As part of the human condition we gravitate towards areas where we are successful, thus enjoyable. Having some knowledge and ability in all subject matter makes for a well rounded individual, but is not necessary to live a successful and healthy life. However, a lack of knowledge and ability regarding physical activity negatively affects ones health and quality of life. A Physical Education model is needed where each individual can achieve the prerequisite knowledge and ability to develop a level of enjoyment. Dr. Faigenbaum states “Our societal response to the current pandemic of physical inactivity has been incomplete, second-rate and largely unsuccessful.”, and that “We need to critically examine our current policies, practices and beliefs.” I agree completely, we must be proactive and treat the cause as well as the symptoms. Inactivity and hours of unhealthy diversion (TV, computer, and gaming consol) are symptoms in large part caused by ineffective education, access, and mentorship. Treating the cause requires creative methods and diverse opportunities in physical education be presented in an enjoyable manner. The traditional model of physical education is rigid and limited and lacks the opportunity for exploration and creativity, and thus is not enjoyable for most. EDD is an unfortunate condition that Dr. Faigenbaum has pertinently identified. He continues to be a pioneer in thinking outside the sand box. Dr. Faigenbaum, thanks for pointing out the obvious, the decline in movement skills & related health problems, these topics have been the “elephant in the room” for the past 3+ decades. I am a practitioner in the field of education, strength & conditioning. I have been health/physical education teacher at the elementary, jr, high level & sport/strength & coach for 5+ decades. For us professionals who deal with kids on a regular basis, we have observed this progressive skill decline over time. The media & politicians often place great emphasis on diet/nutrition to solve the current problems, but we know it is much more than that. We can agree there are multiple reasons for this decline, but in my opinion, the “EDD” concept has gotten the AMA’s attention. It may be a small step but the potential can be limitless. We must continue to educate & communication with leadership at the national, state & local levels to promote the need to restore quality physical movement education. Larry, we hope the AMA has gotten the EDD message as well! Thanks for writing. Larry, we hope the AMA has received the EDD message as well. Thanks for commenting. Thank you Dr Faigenbaum for an insightful and timely blog post. Far too often, parents and individuals seek a quick fix, band aid approach (medicinal or surgical) for the treatment of obesity and its associated risk factors. What is so beautifully simple about EDD is that the treatment is physical activity. Now that the AMA has defined obesity as a ‘disease’, it will be intriguing to see how funding is directed towards physical activity interventions. However, whilst it is acknowledged that youth should participate in 60 mins of moderate to vigorous physical activity (MVPA) per day, it is imperative that we ask the question of “what constitutes 60 minutes of MVPA”? Too often during physical education classes within the UK, youth (especially children) will be asked to participate in continuous aerobic exercise which is often tedious, repetitive and fails to challenge them in terms of skill/motor control development. This is to some degree a failing in the educational system which trains primary school teachers, as during their college-based programmes, they fail to acquire the skills and knowledge which would enable them to provide a broad-ranging, interesting, challenging and age-appropriate physical literacy curriculum. This is especially worrying given the neural plasticity associated with this particular age group that Dr Faigenbaum eludes to. I agree with the point raised by Dr Lubans with respect to how children would be diagnosed with EDD and what doctors would prescribe for them? I personally think that whilst we need to be able to diagnose those failing to satisfy the recommended physical activity guidelines, it will be critical that we have trained paediatric exercise specialists that can plan, instruct and supervise in a manner that is consistent with the needs of youth of different ages and maturity levels. To that end we need to think carefully of the detail of the remedy, in addition to the diagnosis. Through recent publications, Dr Faigenbaum has examined the links between motor skill competency, muscular strength and long-term exercise adherence, and available evidence would suggest that childhood is a sensitive period of development in which to develop such qualities. It is imperative that those responsible for the delivery of youth-based exercise programmes have the requisite skills to do so. Therefore, moving forwards it will be interesting to see which recognised sport and exercise science/strength and conditioning body is the first to design a well-rounded, youth-specific accreditation scheme, to ensure modern day youth stand the best possible opportunity of reversing (or hopefully preventing) the negative health implications of EDD. Thank you for taking the time to make those insightful comments. You are so right. Children just aren’t exercising as much as they used to. I remember when we had to take P.E. class, not I think it’s an elective at most high schools. There are so many benefits to exercising for adolescents, including building self-esteem and interpersonal skills, both of which are necessary to succeed later in life.